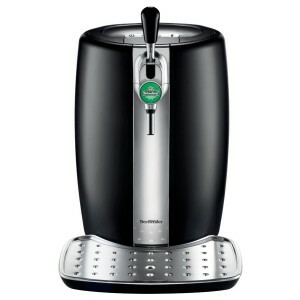 Keep the party at home with this home keg by Krups and Heineken. Maintains beer at the ideal temperature of 37.4 degrees F. Engineered to work exclusively with Heineken, Heineken Premium Light and Newcastle Brown Ale. Ultra quiet and efficient Peltier cooling system provides constant and consistent cooling of the keg. DraughtKeg and Beertender keep beer fresh for 30 days after tapping.